I had the opportunity to borrow a commercial crittercam for a week from the local wildlife center. Having grown frustrated with the high number of false positives on my Raspberry Pi based crittercam, I was looking forward to see how a commercial camera compared. 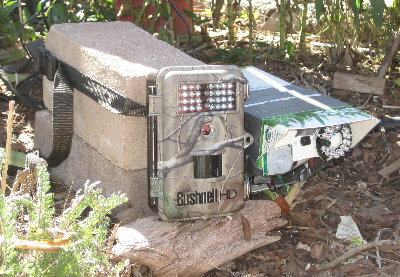 The Bushnell Trophycam I borrowed is a nicely compact, waterproof unit, meant to strap to a tree or similar object. It has an 8-megapixel camera that records photos to the SD card -- no wi-fi. (I believe there are more expensive models that offer wi-fi.) 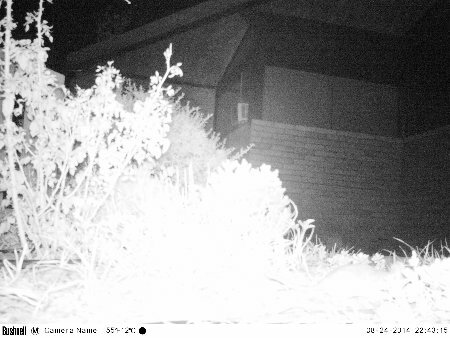 The camera captures IR as well as visible light, like the PiCam NoIR, and there's an IR LED illuminator (quite a bit stronger than the cheap one I bought for my crittercam) as well as what looks like a passive IR sensor. 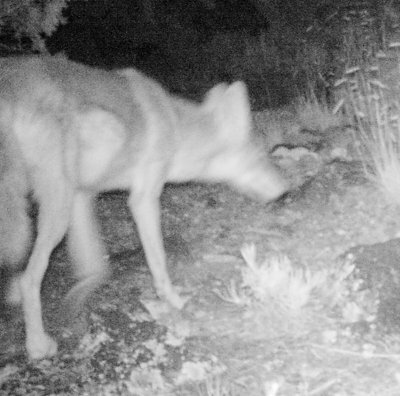 I know the TrophyCam isn't immune to false positives; I've heard complaints along those lines from a student who's using them to do wildlife monitoring for LANL. But how would it compare with my homebuilt crittercam? I put out the TrophyCam first night, with bait (sunflower seeds) in front of the camera. In the morning I had ... nothing. No false positives, but no critters either. I did have some shots of myself, walking away from it after setting it up, walking up to it to adjust it after it got dark, and some sideways shots while I fiddled with the latches trying to turn it off in the morning, so I know it was working. But no woodrats -- and I always catch a woodrat or two in PiCritterCam runs. Besides, the seeds I'd put out were gone, so somebody had definitely been by during the night. Obviously I needed a more sensitive setting. I fiddled with the options, changed the sensitivity from automatic to the most sensitive setting, and set it out for a second night, side by side with my Pi Crittercam. This time it did a little better, though not by much: one nighttime shot with a something in it, plus one shot of someone's furry back and two shots of a mourning dove after sunrise. What few nighttime shots there were were mostly so blown out you couldn't see any detail to be sure. Doesn't this camera know how to adjust its exposure? The shot here has a creature in it. See it? I didn't either, at first. It's just to the right of the bush. You can just see the curve of its back and the beginning of a tail. Meanwhile, the Pi cam sitting next to it caught eight reasonably exposed nocturnal woodrat shots and two dove shots after dawn. And 369 false positives where a leaf had moved in the wind or a dawn shadow was marching across the ground. The TrophyCam only shot 47 photos total: 24 were of me, fiddling with the camera setup to get them both pointing in the right direction, leaving 20 false positives. So the Bushnell, clearly, gives you fewer false positives to hunt through -- but you're also a lot less likely to catch an actual critter. It also doesn't deal well with exposures in small areas and close distances: its IR light source seems to be too bright for the camera to cope with. I'm guessing, based on the name, that it's designed for shooting deer walking by fifty feet away, not woodrats at a two-foot distance. Okay, so let's see what the camera can do in a larger space. The next two nights I set it up in large open areas to see what walked by. The first night it caught four rabbit shots that night, with only five false positives. The quality wasn't great, though: all long exposures of blurred bunnies. The second night it caught nothing at all overnight, but three rabbit shots the next morning. No false positives. The final night, I strapped it to a piñon tree facing a little clearing in the woods. Only two morning rabbits, but during the night it caught a coyote. And only 5 false positives. I've never caught a coyote (or anything else larger than a rabbit) with the PiCam. So I'm not sure what to think. It's certainly a lot more relaxing to go through the minimal output of the TrophyCam to see what I caught. And it's certainly a lot easier to set up, and more waterproof, than my jury-rigged milk carton setup with its two AC cords, one for the Pi and one for the IR sensor. Being self-contained and battery operated makes it easy to set up anywhere, not just near a power plug. But it's made me rethink my pessimistic notion that I should give up on this homemade PiCam setup and buy a commercial camera. Even on its most sensitive setting, I can't make the TrophyCam sensitive enough to catch small animals. And the PiCam gets better picture quality than the Bushnell, not to mention the option of hooking up a separate camera with flash. So I guess I can't give up on the Pi setup yet. I just have to come up with a sensible way of taming the false positives. I've been doing a lot of experimenting with SimpleCV image processing, but alas, it's no better at detecting actual critters than my simple pixel-counting script was. But maybe I'll find the answer, one of these days. Meanwhile, I may look into battery power.